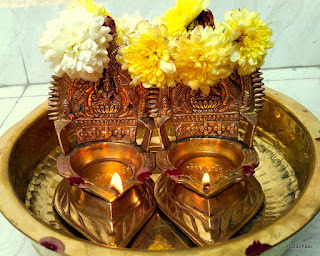 Kaarthigai Deepam is a festival celebrated in the tamil month Kaarthigai. Thiru Kaarthigai occurs on the full moon day of Karthigai month. The interesting part of this function is that people lit lot of lamps in their homes. The lamps are also placed outside the houses and the entire town looks pleasant in the evening. This festival is most significant for Lord Muruga and Lord Siva. Since the festival is celebrated in the evening, we have time in the morning for the preparation. Elders in my family insist on lighting all the lamps in house including those we have in silver. Most people celebrate this Karthigai deepam festival on the same day when Tiruvannamali deepam is also lit. Kids at home helps to clean the lamps, apply sandal and kumkum, place the wick and pour oil. All these are completed by noon. Elders prepare Pori urundai in the morning itself after taking bath. This pori urundai is not preferred to be made at home during the other months. While preparing the urudai, initially two small Paruppu thengai are prepared and placed aside. My MIL used to prepare Nel pori urundai as well. Payasam, appam, Ulundu vadai are prepared for Neivedyam. Few people also prepare adai on this day. People from Tirunelveli as native do not prepare Urundai, they just mix the Pori with Vella paagu and keep it loose. Ladies decorate house with Maakolam. All rooms in the house are lit with lamp and electrical lights in the evening. None of the room is left dark including bath rooms. Elders are specific about completing the pooja before 6 PM in the evening and lit lamps by 6'o clock without delay. Married ladies wear Madisar saree while liting the lamps. Agal Vilakku made of mud is most importantly used on this day. It is a tradition that we buy few new lamps every year. Women who are recently married and for whom it is Thalai Kaarthigai celebrate this ritual with special efforts. Since this is the first time for them in their in laws house, they are careful about learning the rituals followed in their home. My mom used to get new dress for us on Kaarthigai. Neivedyam is offered to god along with Betal Leaves & Nuts, Fruits, Coconut and the Neivedhyam prepared at home . Then the lamps are placed both inside and outside the house. During this month, we lit minimum 1 lamp in our entrance from day 1. This continues till the last day of the month. Kids also keep a portion of the crackers & Sparkles purchased during Diwali and celebrate kaarthigai. This festival continues for 3 days. The last day is called as Kuppai Kaarthigai. Brothers used to gift their sisters. Brought back mempries of Karthigai Deepam celebrations in Ashok Nagar Mythili. Feeling nostalgic. Nicely written.